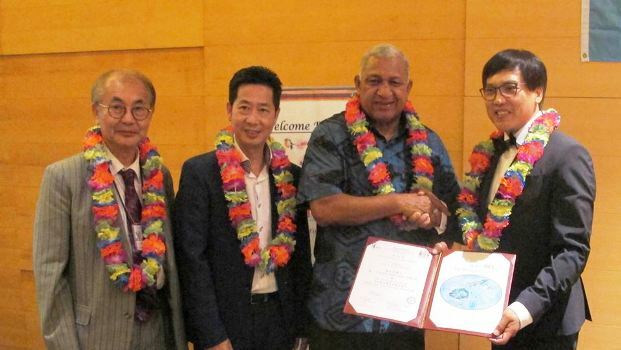 Prime Minister, Voreqe Bainimarama, has pointed to sound policies and incentives as contributing factors towards Fiji’s consistent economic growth at a reception hosted by the Hong Kong Fiji Chamber of Commerce. Bainimarama also reiterated the incentives that Fiji can offer to foreign investors including low to tax – free incentives, Fiji’s skilled labor force, Fiji’s position as a hub in the region and a strong manufacturing base. He cited other examples similar to these that Chinese investors can capitalize on that will benefit Fijians and investors. Bainimarama and members of a government delegation were hosted to the reception in Hong Kong last night. The Prime Minister stopped in Hong Kong before traveling to China where he is leading a State Visit to Beijing later this week.